It looks like a Twitter sale is coming soon. Several reports over the past week have claimed that multiple tech and media giants are eyeing a bid for the social networking company. Claimed suitors range from Google to Salesforce to Disney. The company's struggles are well-documented, from both a business and a product point of view. But this chart from Citi Research helps put things into perspective. Since 2009, the California-based company has experienced a serious amount of senior level turnover. It's had four CEOs in that time, for one, but it's also seen a number of product management, engineering, and other high-level roles change hands. 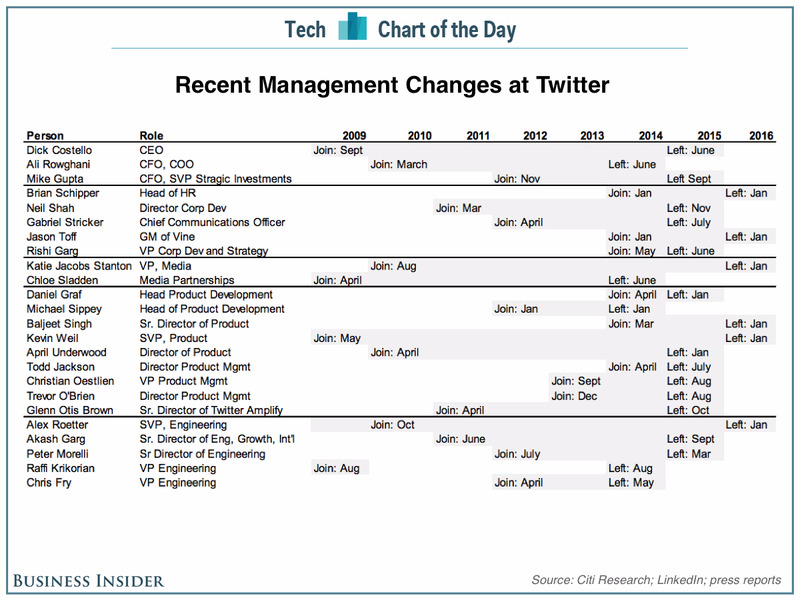 Citi's analysts cite this as one example of why buying Twitter would be a big risk for a company like Disney. "Any way we slice the data, we just can't get enthusiastic about this potential transaction," they said.